PayPal Seller Protection is a policy that can protect your transactions from chargebacks, reversals, and their associated fees. This means that if you sell something to a buyer, and they dispute or reverse the transaction, you may be eligible to retain the full purchase amount and avoid any related chargeback fees paid (for debit and credit card-funded transactions). Unauthorized Transactions. This is when a buyer claims they didn’t authorize a payment. Items Not Received. This is when a buyer claims they never received the item they purchased. What PayPal Seller Protection doesn’t cover. 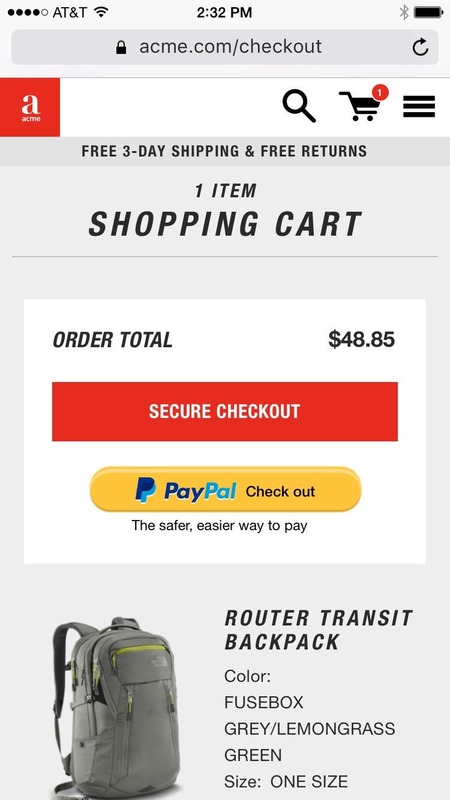 You must ship the item to the shipping address on the transaction details page in your PayPal account for the transaction. If you originally ship the item to the recipient&apos;s shipping address on the transaction details page but the item is later redirected to a different address, you will not be eligible for PayPal Seller Protection. We therefore recommend not using a shipping service that is arranged by the buyer, so that you will be able to provide valid proof of shipping and delivery. You must respond to PayPal&apos;s requests for documentation and other information in a timely manner as requested in our email correspondence with you or in our correspondence with you through the Resolution Center. If you do not respond to PayPal’s request for documentation and other information in the time requested, you may not be eligible for Seller Protection. What happens if you receive a complaint? How to prevent complaints and reversals. You can also access additional information about Seller Protection by reviewing our FAQs at the bottom of this page. In case of a shipping problem, file an insurance claim with the shipping company. You, your customer or the shipping company can report claims. Contact your shipping company for detailed instructions on how you should proceed with a claim. Be aware of insurance exceptions. Liability for loss or damage may be limited depending on the type of package, the declared value, and/or the shipping company. Talk to the shipping company to ensure proper coverage. Delay shipment for new orders that are expensive and in demand for 24 to 48 hours, especially when shipping internationally. Use caution when shipping overnight. Fraudsters will often ask for overnight shipping so that they can resell expensive merchandise as quickly as possible. Venmo is a social payments service used by millions of people to make and share payments with friends, family, and select approved businesses. It’s similar to PayPal, but is unique in that Venmo allows users to share and like payments and purchases through a social feed. The service is popular with the millennial generation. ● Users can make payments by linking their bank account, debit/credit card or by using their Venmo balance. ● Once a bank account is connected, users can easily transfer their Venmo balance to their bank account. ● Users can transfer money quickly using a friend’s phone number, email address or username. If a recipient doesn’t have a Venmo account and a payment is sent using their email address or phone number, the recipient can create an account in order to receive the funds. If they chose to, users can also find friends automatically by syncing their Facebook account or phonebook. ● Splitting payments with friends and family like a dinner bill, concert tickets or the cost of a road trip is one of the most popular uses of Venmo. ● Many Venmo users like to share their payments and purchases on the Venmo social feed with a fun comment. The actual payment amounts are hidden. ● Find out more about the Venmo checkout experience and additional details. What will my customer see? 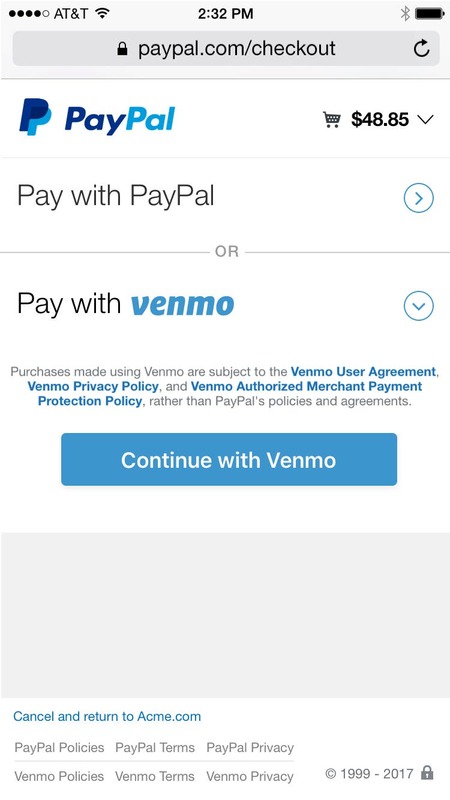 If your customer has opted-in to make payments through Venmo, they will be presented with an option to pay with their Venmo account after clicking your PayPal payment button. Please note: Venmo users will receive a Venmo-branded transaction receipt in addition to any receipt you currently provide. Will I have to change my integration with PayPal to accept Venmo payments? What are the costs to accept Venmo payments? There is no additional cost to accept Venmo. You will pay the same fees for Venmo payments as you do for PayPal payments. Will Venmo transactions be covered by PayPal's Seller Protection Policy? Yes, the PayPal Seller Protection Policy will apply to Venmo-funded transactions received through your PayPal account. To learn more about the PayPal Seller Protection Policy eligibility requirements, click here. Are payments made by Venmo users through my PayPal account subject to the PayPal Purchase Protection Policy? Venmo payments are covered by the Venmo Authorized Merchant Payment Protection Policy, which generally mirrors the PayPal Purchase Protection Policy, but varies in some places. To learn more, read the Venmo Authorized Merchant Payment Protection policy. Can my business be promoted through the Venmo app? Yes. Venmo users have the option to share purchases in their Venmo social feed. This could include the purchases they make on your site. Note, purchase price won’t be included in their social posts. Is this available to merchants or consumers outside of the US? Currently, Venmo is only accepted within the US and with US merchants. Will Venmo payments be available for desktop transactions? At launch, Venmo payments will only be available for mobile transactions. Desktop support may be available in the future. Will Venmo pass the consumer’s shipping addresses to me? 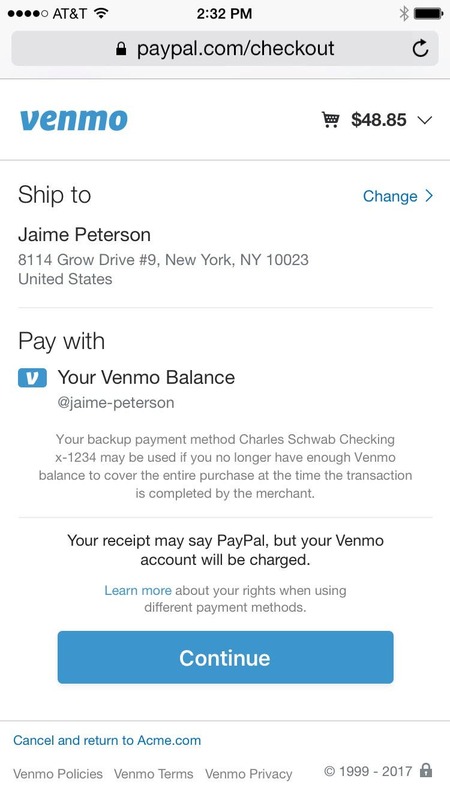 If your current PayPal integration is set up to receive shipping address, this will not change with the Venmo option. For more information on Venmo purchases, visit the Venmo Help Center. What is Virtual Terminal and how does it work? Virtual Terminal is bundled with our customizable payment solution, PayPal Payments Pro. Virtual Terminal allows merchants to accept payments virtually anywhere they have Internet access, with no card swipe or software to install, and is ideal for merchants who receive orders by phone, fax, or face to face. Grow your business – Process payments for major credit and debit cards. Extend your reach to customers who prefer not to pay online, including customers without a PayPal account. Process payments anywhere – Process payments anywhere through any device with an Internet connection and a web browser. Zero setup – Virtual Terminal requires no coding or specific software installation to get started. Use PayPal as a one-stop payment solution and more – Process your customers' orders through a PayPal-hosted online payment form along with a set of tools for intuitive reporting; printing shipping labels and packing slips; and printing or emailing transaction receipts. Process multiple payments simultaneously – You can launch multiple Virtual Terminal instances to process payments, as in the case of a call center or during heavy demand. Note: PayPal's Seller Protection Policy doesn't apply to transactions processed using Virtual Terminal. Log in to Virtual Terminal. When you're ready to process a payment, go to our website and log in to your PayPal account. Click Tools at the top of the page, then select Virtual Terminal. Enter the order. Enter the order details and credit or debit card information. 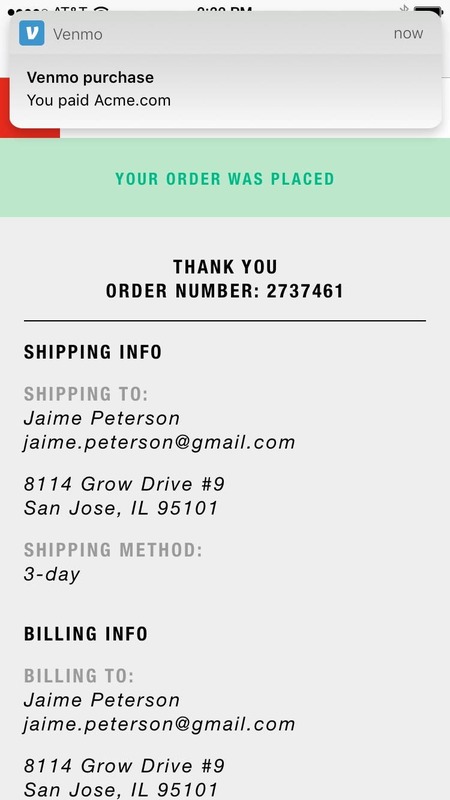 If you're mailing an item, include the shipping information. Complete the transaction. You'll receive a confirmation for successful transactions. You'll then have the option to print a receipt or packing slip, email the receipt to your customer, or process another payment. Virtual Terminal costs $30/month USD, with no setup, termination, or withdrawal fees. Per-transaction fees of 3.1 percent + $0.30 apply. If you encounter any issues when signing up or processing payments, reach out to Merchant Technical Support. What must I do to start using Virtual Terminal? How do I enter and process transactions in Virtual Terminal? Shipping best practices for preventing losses. As a business owner, learning how to avoid losses is beneficial to you. Here are some simple and effective tactics you can use to help prevent or minimize Item Not Received losses.